SCROLL OF ESTHER: This is the sixth of six panels in a fourteen foot long Megillat Esther, Scroll of Esther. The decorations in this panel include a flower and grape motif from Hisham's Palace and three crowns. 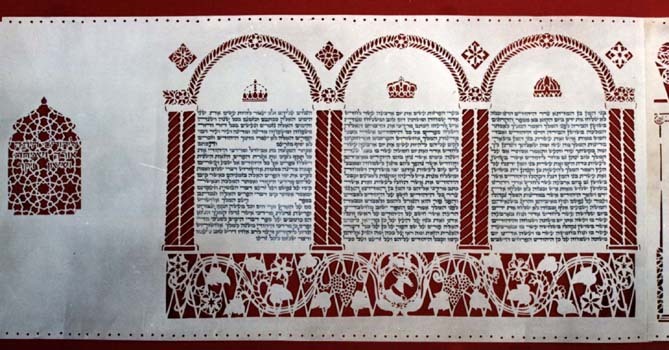 Most of the columns in this scroll start with the word hamelech, Hebrew for "the King". Above each a crown was cut into the parchment. As mentioned earlier, G-d's name does not appear in this book of the Bible, but we are taught that G-d played a hidden part througout the story. Every time the word hamelech appears, one can infer a double meaning: the action in the story is being directed by the Almighty. At the end of the scroll there is a small window. The window is overlaid with a veres from the Megillah, which translates as, "The Jews had light and joy, and gladness and honor." Just as windows allow us to look beyond the physical walls which limit our perception, the Book of Esther teaches us to see beyond our limited perceptions of the world.